Would it surprise you to learn that Satan has fought against God’s plans primarily through seven pagan empires and that the rise and fall of these empires are chronicled in scripture? They are the seven empires Satan has used to persecute Israel throughout its history. Scripture also foretells that one of these seven empires will return in the end times as Satan’s final empire and will be ruled over by Antichrist. This means that no less than seven world empires are chronicled in scripture to rule the world for Satan. Six of these are historic empires and named in scripture. The last one can be identified by studying history and prophecy about the end times. Seven successive empires rule over Israel all the way from Egypt until God establishes the Millennial Kingdom. The seven historical empires are Egypt, Assyria, Babylon, Persia, Greece, Rome and Islam. This last one will appear in two phases: Islamic Empire ending with the Ottoman Empire (“Phase I”) and the re-emergent Islamic Empire of the 10-King Caliphate (“Phase II”). They (Israel) will fall by the sword and be taken as prisoners to all nations. Jerusalem will be trampled on by the Gentiles until the times of the Gentiles are fulfilled. dream in chapter two. In the dream, the king sees a massive metallic statue that portrays four of Satan’s empires from Babylon to Islam. The picture of the divided 10-toe empire (Dan. 2:40-44) graphically portrays the Sunni-Shiite division within Islam that is fighting for supremacy in the Middle East today. Daniel provides a surprising amount of detail concerning both Greece and Islam. Both Chapters 7 and 11 highlight the life of the forerunner of Antichrist (Syrian King Antiochus – 165 BC) and Daniel 11 contains the longest description in the Bible about the wars, atrocities and activities of Antichrist. 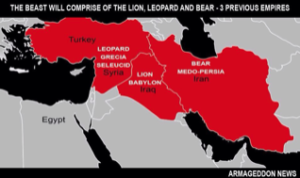 And the beast which I saw was like a leopard (Greece), and his feet were like those of a bear (Persia), and his mouth like the mouth of a lion (Babylon). And the dragon gave him his power and his throne and great authority. Where will Antichrist come from? This animal imagery that portrays the empires comes from Daniel 7:4-6. The modern empires depicted therefore, that make up the final empire, include the regions of Turkey/Syria, Iraq, and Iran. The final empire will cover all the territory of these 3 former empires and will be ruled by the (10-toes) 10-King Caliphate. Nowhere in the Bible have these figurative identities ever been changed. 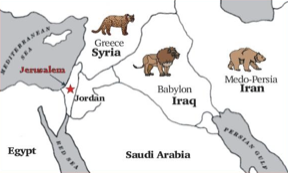 So when we read about a beast in Revelation with these same names, we have every reason to believe the Lord is pointing us to watch the offspring of those empires as the same location for the coming beast empire. Did you get that? The empire of Antichrist will rise from these empires! able to compete with the Sunni block of Muslim nations like Turkey and become a major force within the 10-King Caliphate. This is what is prophesied in Daniel 2:40-44 which describes the Caliphate being a bad mix, partially weak and partially strong. It appears from the above map and from Revelation 13:2, that the Shiite block will have major sway in the coming Caliphate. There is a good possibility that four of the 10 Kings could be from the Shiite nations of Lebanon, Syria, Iraq and Iran. These nations seem to be well on their way of fitting into the end time beast empire of the Antichrist. The strong Shiite presence within the Caliphate leaves the door open, for at least the possibility, that Antichrist could be the awaited Shiite messiah known as the Mahdi. According to Islamic tradition, the Mahdi will appear in the end times and lead Muslims to rule the world. He will be a great leader who arrives in a time of chaos to lead the Islamic Caliphate against the Jewish people and Christianity. His exploits are eerily similar to the one we know as Antichrist. 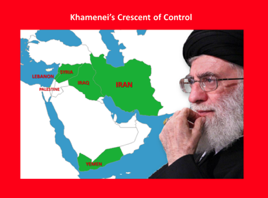 Iran, the strongest and most militant Shiite nation has designed their nuclear program and expansionist policies solely on the hope of the coming Mahdi. As such, Iran continues to gain traction as they seek to build out their “Shia Crescent” and combine the region under their wing. The nations are now lining up like Satan has dialed them up on the phone and gave them instructions to begin to take their rightful places in his empire. Just as seen in Nebuchadnezzar’s dream, the final empire is beginning to appear right before our eyes. Nebuchadnezzar’s 2500 year old metallic image that Daniel revealed to him is an exact portrait of Satan’s final empire. The Shiite crescent I believe will be the revived kingdom of the north in Daniel 11. There is actually right now an entity forming south of Israel as well and they are all Sunni nations. This entity is called Arab NATO or middle east strategic alliance (MESA). It is proposed to be an alliance of 6 gulf states in the Arabian Peninsula along with Egypt and Jordan. Interestingly the Bible says that after the AC rises he waxes great toward the south and subdues 3 kings. I believe he will subdue 3 kings in the Arabian Peninsula. After this in Daniel 11:23 he makes a league with himself. Probably “confirms” the Shiite crescent. He then goes to war with Egypt (ancient king of the south). This I believe is the kingdom against kingdom Jesus speaks of in Matthew 24. All the while Jordan escapes out of his hands (Daniel 11:41). Interestingly the leadership of Jordan just recently said they would not join Arab NATO or any alliance in the near future. This is probably why they escape out of the AC hands. This stuff is all VERY near. I believe we are very deep into the feet of the statue in Daniel 2. Many don’t realize that the 2 thighs of brass on the statue represent the ancient kingdoms of north and south (Seleucid and Ptolemy). The legs of iron have to represent a kingdom that conquered the areas of kingdoms of north and south. Rome did NOT because Rome never conquered Babylon (Iraq) and Persia (Iran). However Sunni Islam did conquer that entire area through the 4 main Islamic Caliphates of the middle east (Rashidun, Umayyad, Abbasid and Ottoman). Sunni Islam (iron) dominated this area from the 6th century AD until recent times (even after 1924). But in recent times Shiites (clay) have begun to take over the kingdom of the north area of the beast. In 1971 the Assad regime (Shiite Alawites) took over Syria. This is when I believe the clay started to be added to the iron. Then more clay when the Islamic republic of Iran took over in 1979. Then more when Hezbollah came along in Lebanon in 1985. Iraq has been a Shiite majority for probably at least 20 yrs now and the last 3 leaders of Iraq have been Shiites. So there has been clay mixed with the iron for a while now. This is why the Bible says the AC kingdom shall be a divided kingdom. A bad mix as you said. Because I think it will be Shiite kingdom of north vs Sunni kingdom of south.